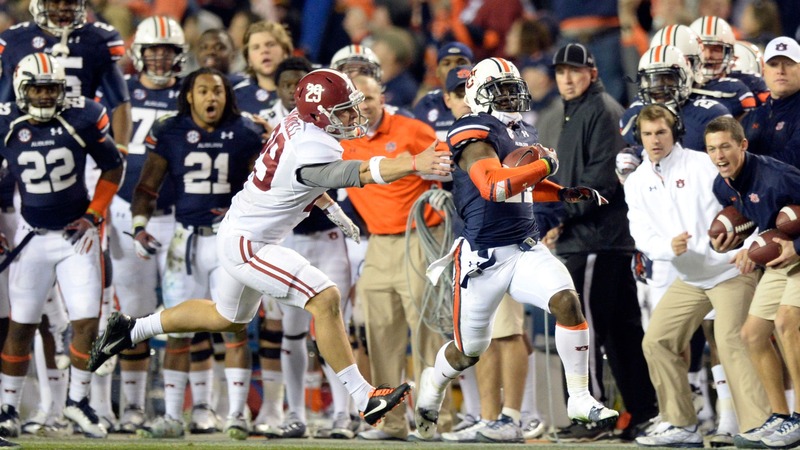 Yes, it happened two days ago, but Auburn’s stunning 34-28 win over Alabama is still the story of the day. In case you missed any of the fallout, the Big Buzz has you covered. Here was the reaction to Chris Davis’ 109-yard touchdown return (just look above to see how close he came to getting caught) from Nick Saban, Twitter and various fans who posted videos on YouTube. This is how Ohio State players reacted. You can listen to the local radio calls from each team here. Lastly, here’s the Tecmo Bowl version of Davis’ touchdown. Former Auburn linebacker Takeo Spikes held up this sign at Toomer’s Corner after the Tigers’ win. Toronto mayor Rob Ford made his presence known at the Falcons-Bills game. … Nobody can scream the F-word better than Tom Brady. … Prior to kickoff against the Chiefs, Broncos running back Knowshon Moreno cried like no one has ever cried before. … Bears wide receiver Alshon Jeffery had the touchdown catch of the day. … Niners tight end Vernon Davis pulled off not one, but two impressive hurdles against the Rams. … This happened to RGIII last night. The Browns official Twitter account didn’t sound too pleased with quarterback Brandon Weeden yesterday. Spurs guard Manu Ginobili pulled off this nifty pass through the legs of Dwight Howard during Saturday’s game against the Rockets. He anchored an actual newscast over the weekend for North Dakota’s KXMB. Here’s what things looked like the morning after the win against Alabama. Here’s an honest trailer about the best Christmas movie of all time. Sports Illustrated swimsuit model Ariel Meredith posted this twerking video on Instagram over the weekend, so we thought she deserved today’s Fox-y Lady honors.